Bite Not One Another’: Selected Accounts of Nonviolent Struggle in Africa chronicles events and activities from sub-Saharan Africa, highlighting colonial era nonviolent struggles that resulted in independence and contemporary collective action to secure human rights and social justice. Written by a young lecturer from Sierra Leone, it also features examples of African women’s ongoing nonviolent activism. 123 pp. Strategic Nonviolent Struggle: A Training Manual is a tool for civil society leaders—in youth movements and programmes, churches, athletics, and other areas—who are interested in creating workshops or training programmes on realistic alternatives to armed struggle. 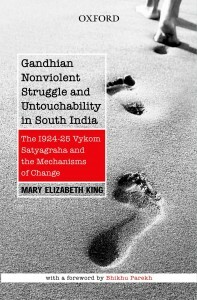 It presents an overview of the effectiveness of nonviolent struggle and can complement the more theoretical Teaching Model: Nonviolent Transformation of Conflict. 141 pp. Only Young Once: An Introduction to Nonviolent Struggle for Youths is a practical guide geared alike towards university or secondary school students, young soldiers, young professionals, civil society leaders, and youthful parliamentarians. It challenges the blind faith in violence so often found where there is conflict while also explaining the basic ideas and principles of nonviolent action. In the classroom, it can be used to supplement Teaching Model: Nonviolent Transformation of Conflict. It also complements ‘Bite Not One Another’: Selected Accounts of Nonviolent Struggle in Africa. 88 pp. Teaching Model: Nonviolent Transformation of Conflict presents a framework for use by instructors in teaching students the basic theoretical and historical background of nonviolent action and successful practice of it. The model assumes a twelve-week term for teaching one topic, or module, per week for final-year undergraduates, but it can also be adapted for graduate work. Each module contains a note to lecturers discussing crucial background needed to lead a class on the topic, expected outcomes in student learning, concepts relevant to that particular module, suggested class activities and exercises, and recommended readings on each topic. The framework allows instructors to add resources from their own country and to encourage students to write case studies about local nonviolent campaigns and document breakthroughs by area non-governmental organizations. 139 pp. Research in the field of peace and conflict studies needs to improve the quality and relevance of knowledge by and for Africa. 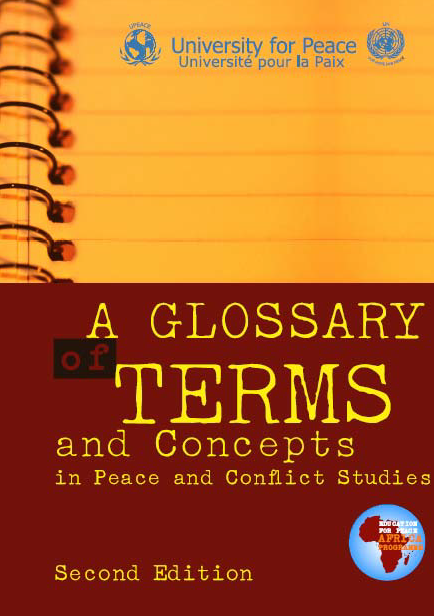 This requires a healthy debate over appropriate methodologies and epistemological approaches, the linkage between theory and application as policy, and the ways in which peace and conflict studies research can be usefully compared to that in other fields. This is important for bridging the gap between the study of peace and conflict resolution issues and on-the-ground peace-building activities in Africa, relating the theory and empirical research to the practical needs of practitioners and decision makers. Such research should offer both a conceptual foundation of applicable and operational theory and case study examples that address ways in which political, economic, and social factors influence conflicts in Africa. 368 pp. After years of civil war among the five major clans in Somalia, which are determined by male lineage, Somali women realized that any peace that distributed power based on traditional clan structures would ensure that women’s voices were omitted. In 2000, at a national peace conference, 92 women delegates lobbied and were recognized as the Sixth Clan, irrespective of their customary clan identity. This small volume is an introduction to how it came about that Somali women asserted the wisdom and experience they possessed as a tool for building peace. Although civil war would again engulf the nation, the story of the women of Somalia has much in common with cases and patterns emerging in a growing body of literature on gender and peace building, and yet the techniques employed by the women in Somalia are original, imaginative, cultural, and replicable. 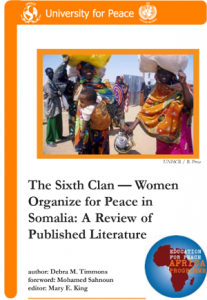 Focusing mainly on women’s experiences in southern Somalia, this bird’s-eye view of the women’s struggles and triumphs is based on available English-language case studies, analyses, and information. 30 pp. 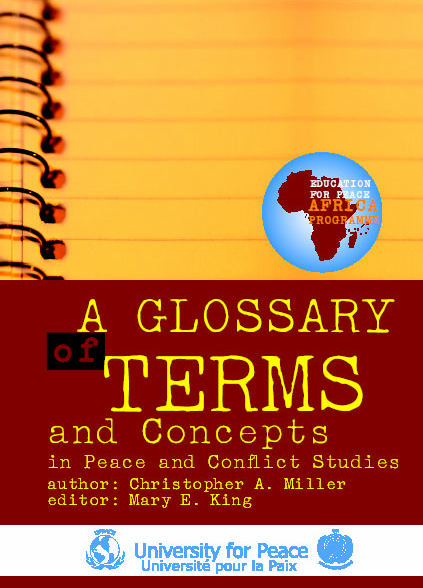 In 2004, the Africa Programme of the University for Peace published “A Glossary of Terms and Concepts in Peace and Conflict Studies.” It has since been freely distributed for use in universities and non-governmental organizations throughout Africa, in response to the intense demands for materials on peace and conflict studies. With affirmative feedback from African academicians to the first Glossary, and being judged a success, the second Glossary was completed based on specific suggestions and comments gathered in the course of academic activities. Projects such as this always need updating.